There are many ways to get to Bantayan Island. However, the four of us decided to ride a bus from the City North Bus terminal to Hagnaya Port, then ride the Aznar fastcraft to the island. Oh well, according to Anton's blog, the schedule of the fast craft was around 11-11:30am so we wanted to make sure we'd be able to make it in time. We arrived in Cebu on time (of course, because Cebu Pacific is never late right? hehe) and we were able to exit the airport around 8am. We wanted to get a cab to get to the City North Bus Terminal, but the lady in charge of one of the rent-a-cars was charging us 300 bucks for the thirty-minute ride!!! She asked us though where we were going, so we told her that we wanted to go to Hagnaya Port to get to Bantayan Island. Hmmm. Divided by 4, that was 450 pesos each. The trip was a little more than two hours, arriving in Hagnaya Port before 10:30am. We were way ahead of schedule -- the fastcraft wasn't scheduled to leave in an hour. So we decided to take the slower but earlier Super Shuttle Ferry which was going to leave in a few minutes. Travel time to Bantayan Island was estimated to be an hour. The ferry fare was around 140 pesos per person, I forgot the exact amount. Terminal (port?) fee was five pesos per person. There was a lot of construction work being done on the port, so there was a lot of port hands who will offer to carry your stuff. But of course, this was not free, so we opted to carry our things [kaya naman eh :)]. You might also get put off by the ehem rustic look of the port and the ferry but they look safe naman. Most important thing was the ferry was clean and neat. There were like around 10 passengers aboard the ferry that trip. There were of course the ferry men (hihihih) who spent most of the trip banging on the sides of the ferry to take out the rust? I think. Hehehe. The passengers stayed on the second level of the ferry while the ferry men were on the first level. The best thing about the ferry? 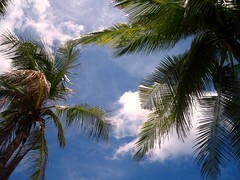 The cool sea breeze! :) It was so relaxing to just look out from the port or starboard side, breathing in the salty air, seeing endless sea and sky. It was the opening act of our laid-back stay in Bantayan Island. After an hour or so, we arrived in Bantayan Island. 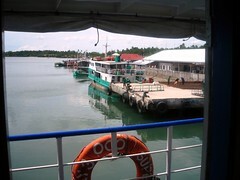 There is a ferry leaving Hagnaya Port for Bantayan Island every thirty minutes. Totally recommended! Manong was neither too fast nor too slow. Wasn't too talkative either so we were able to catch a few zzzz's on our way to Hagnaya. He also offered to pick us up to the port when we go back to the city proper, so he gave us his card. Bait!